We have been so fortunate to work with incredibly beautiful couples, over the years; couples who have gone on to become life-long friends of ours. 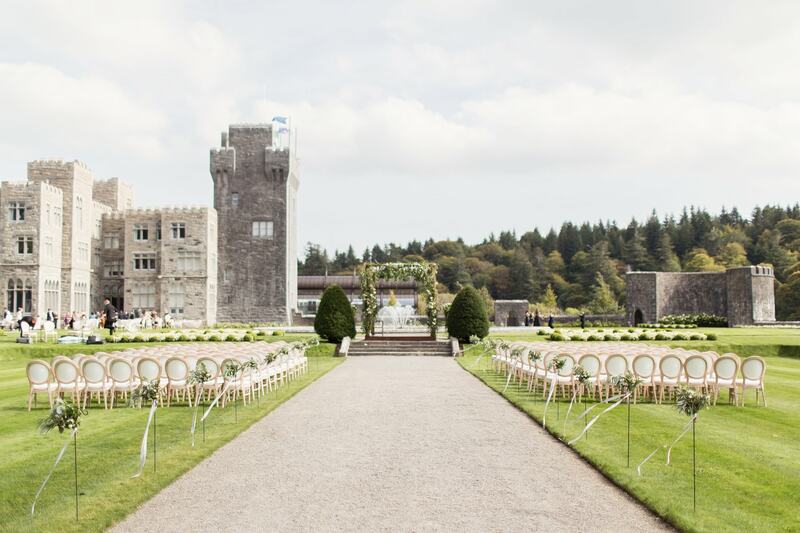 Juliana and Ryan are such a couple and we are delighted to be able to share their thoughts about their fairytale wedding at Ashford Castle in Ireland. 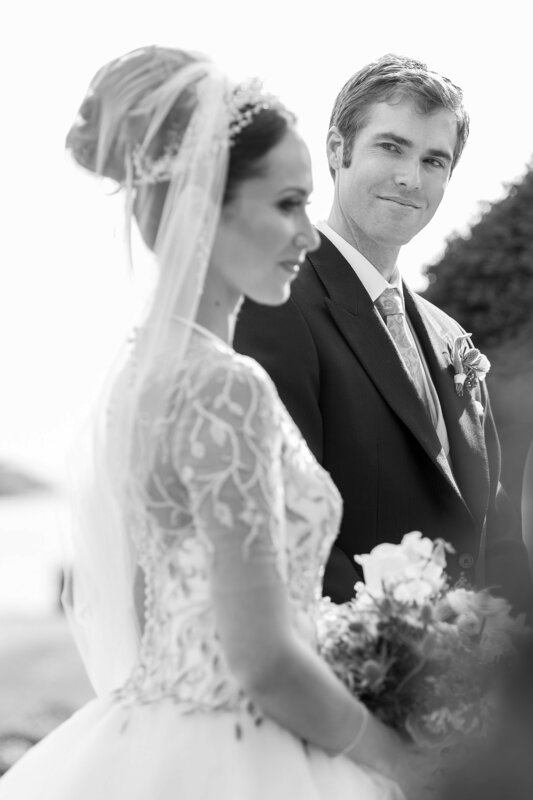 It was such a privilege to create this stunning experience for these two very special people. Images: Craig and Eva Sanders Photography. Hailing from Pacific Palisades, California, Juliana began her career as an actress and professional dancer as a co-founder of Boom Kat Dance Theatre. After working in performing arts for several years, she rediscovered a childhood love of illustration, and founded the design house Good Juju Ink. Outside of work, she is likely to be seen dancing with friends, wishing Downton Abbey would come back, or eating some delicious cheese with family! Originally from Los Angeles, Ryan lives in San Francisco with Juliana and their cat, Wallace. He works on the Business Operations team at Glassdoor, while also working with Juliana to grow Good Juju Ink. He loves sports and nature, and he especially loves capturing nature’s beauty through photography. He also loves to travel, as evidenced by the fact that he and Juliana got married on another continent! Ryan: Believe it or not, we met when we were three years old, as we grew up across the street from one another! According to our nannies, we LOVED playing as toddlers, and there are several pictures of us together as little children. However, we attended different schools, so we didn’t see too much of each other as we grew up. Fast forward many years. After returning back to my home city of Los Angeles after graduating from university, I reconnected with Juliana at a mutual friend’s birthday party. 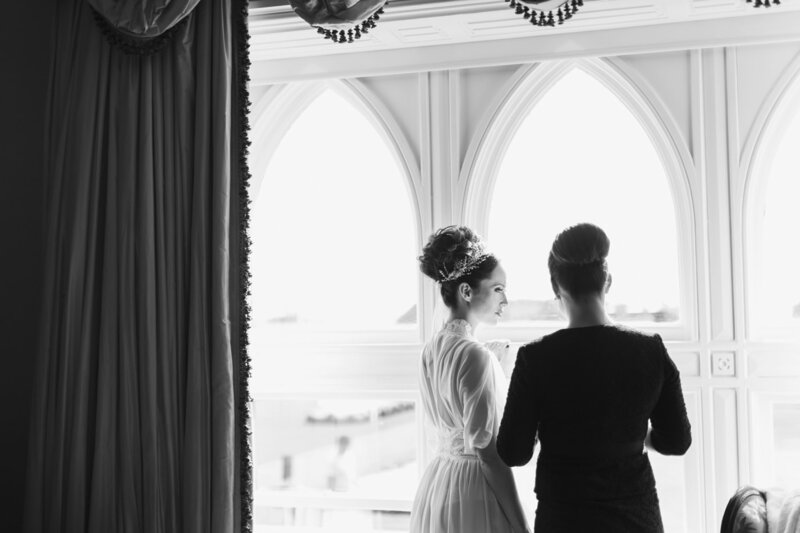 We went on a first date, which led to a second date, a third date, and ultimately our dream wedding at Ashford Castle! Ryan: As I mentioned in my vows, there is nothing better than surprising and delighting Juliana. From the very beginning of our relationship, I’ve taken so much joy in creating fun surprises for Juliana, including scavenger hunts on her birthday and holidays. Even though the scavenger hunts are sometimes silly, Juliana has always participated with such glee and levity. Therefore, when I thought about our engagement, it was obvious that I should create a fun, new scavenger hunt for her. Under the guise of our dating anniversary, I created a scavenger hunt that ultimately led Juliana to a gift sitting under a beautiful redwood tree in Woodside, California. Inside the gift was a framed picture of Juliana and me as toddlers. On the picture frame, I wrote “my girlfriend” on a piece of tape, along with “peel the tape.” When Juliana removed the tape, it revealed my intentions; inscribed on the picture frame were the words “my fiancée.” I knelt down on one knee and asked Juliana to marry me. And she said yes! 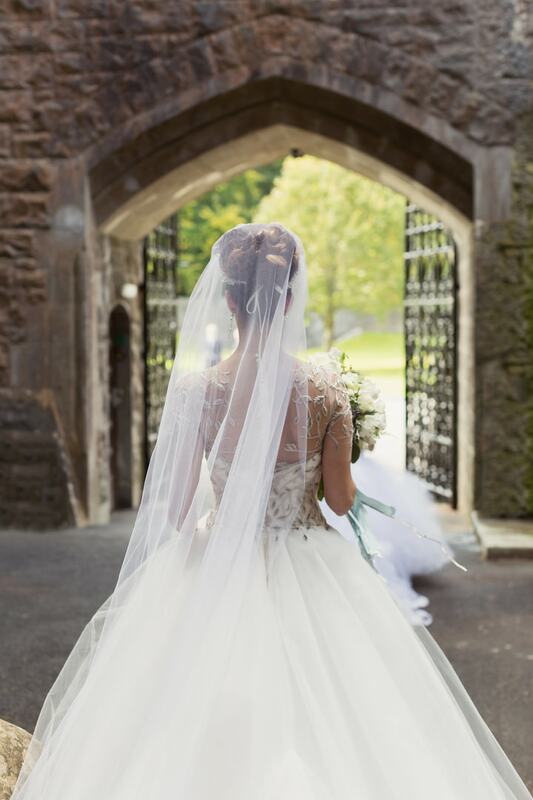 What influenced your decision to get married in Ireland? 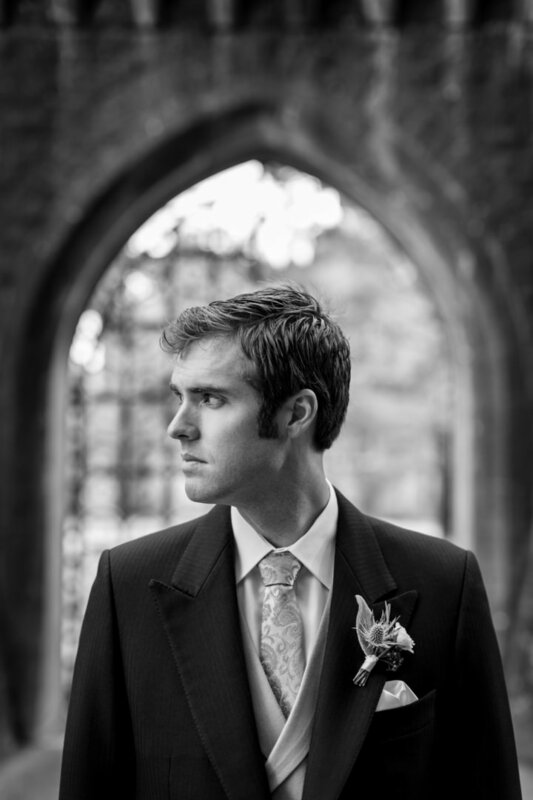 Ryan: We had spent time in Ireland the year before we got engaged, and we fell in love with the country, the people, the history, and Ashford Castle, which would ultimately serve as our wedding venue. Juliana and I both thought it would be wonderful to have a destination wedding at a place where our guests could experience an absolutely magical weekend. In Juliana’s mind, she wanted people to feel as though they were in a fairy tale. Most of our guests had never visited Ireland prior to our wedding, and we knew that they would not be disappointed by their time in the Emerald Isle! We did an Internet search for "Wedding Planners Ireland" and Olivia Buckley International came up. We got in contact with Olivia straight away and knew that we had found our Irish wedding planner just a few minutes into our conversation! 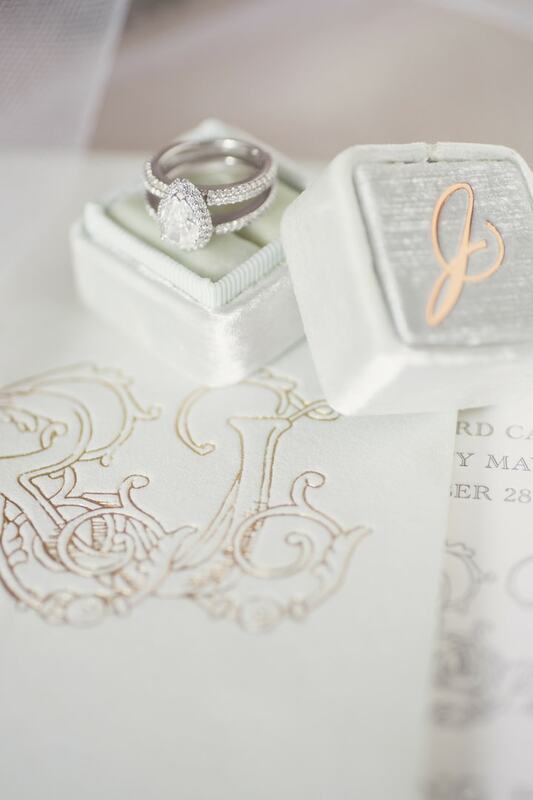 What made you choose an Irish Wedding Planner over an American Wedding Planner, seeing as you are both from the US? What advice would you give to a future bride and groom when selecting a destination wedding planner? Ryan: Do your homework. This is a critical decision, so spend lots of time talking with your potential wedding planner, researching the work they’ve done, and speaking with referrals. Your wedding planner is crucial not only in making sure that your wedding is a success, but also in making sure that the planning is a success. You want to find someone that makes you feel confident that your special day will be perfect, and that there’s no need to worry. And it doesn’t hurt if your wedding planner is someone that becomes a lifelong friend! 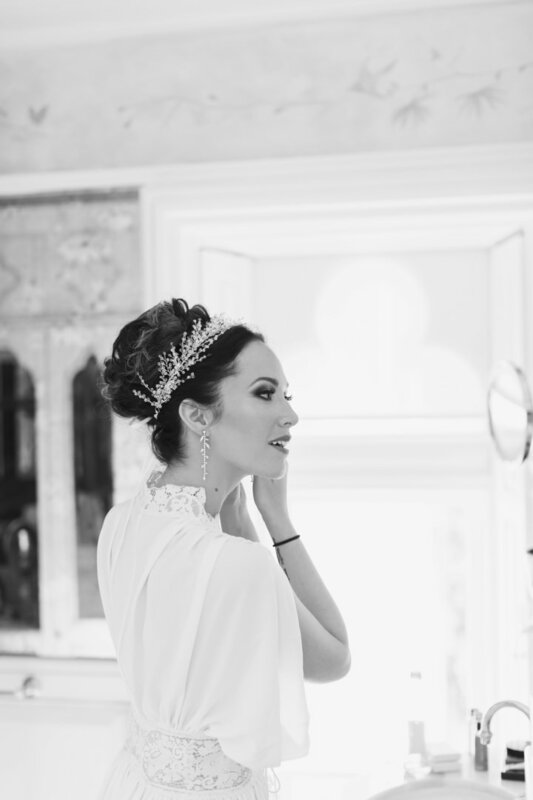 How would you describe the style of your wedding and the process of working with the design team at Olivia Buckley International? Juliana: I would describe the style of our wedding as a classically elegant and sophisticated storybook wedding with a bit of a modern twist. It was so much fun to work with Olivia and her design team as we intertwined elements of Ryan's Scottish heritage with elements of my Jewish heritage. Our ceremony was one for the books. How many people can say they got married under a Jewish Chuppah at a 13th century Irish castle in the middle of a predominantly Catholic country! From an aesthetic perspective, the challenge was to create a fairytale wedding without it being cheesy or tacky. We wanted a combination of “The Secret Garden” meets “Narnia", something ethereal, natural and wild, but also elegant and classic. I wanted every detail of this celebration to be infused with Ryan’s and my personal touch, a nod to adventure, to taking risks, to surrendering to passion. The Olivia Buckley International team literally went antique shopping for us along the Irish coast to find authentic styling pieces that spoke heavily to these themes. From the tea china, to the florals, to the signage, to the welcome pamphlets, to the center pieces, Olivia and her team made sure magic was infused everywhere. How did you feel when you saw it all come together? 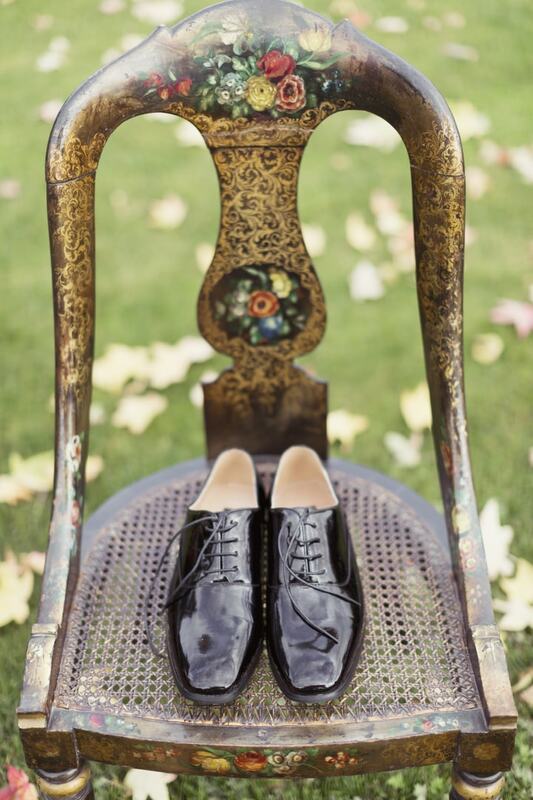 What was the most memorable detail of your wedding weekend? Juliana: It is absolutely impossible to pick just one! 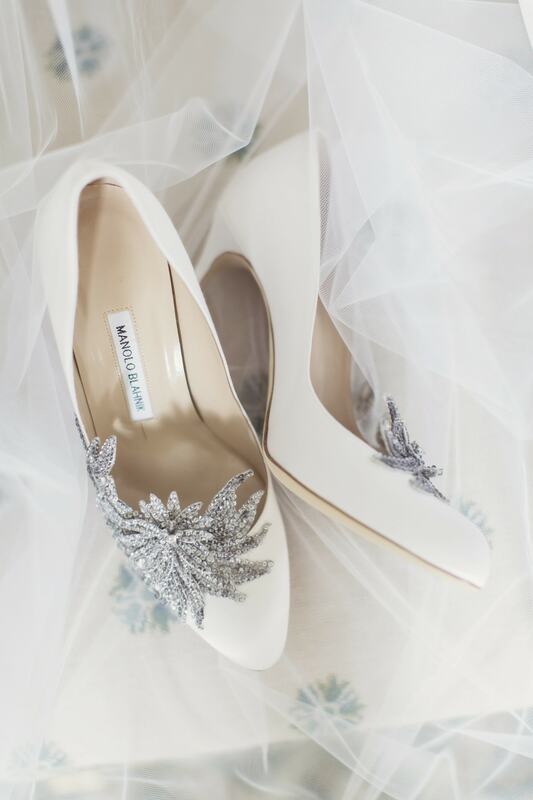 Everything was a memorable detail, because Olivia Buckley International are masters at making memorable details come to life. I remember the napkins they had made for the rehearsal dinner with my favorite love quote letter-pressed into them, I remember the way they transformed the town pub into a gorgeous ethereal garden party that also somehow was able to show a 20-minute-long slide show presentation (equipped with lighting and music) of Ryan and myself from when we were children, I remember the tailor they had staffed at the castle the entire weekend to make sure everyone's dresses and suits fit to their liking, I remember the custom blankets they had prepared for our guests in case people got cold; the blankets each said, "wrap yourself in love", I remember the way Olivia herself held my hand the morning of my wedding and had me look out onto the lake so as to center my breath and my energy before the hustle and bustle of the day began. I could literally go on forever and ever and ever. Most importantly, I remember never worrying about a single thing except soaking in all the love that was around myself and Ryan the entire weekend. 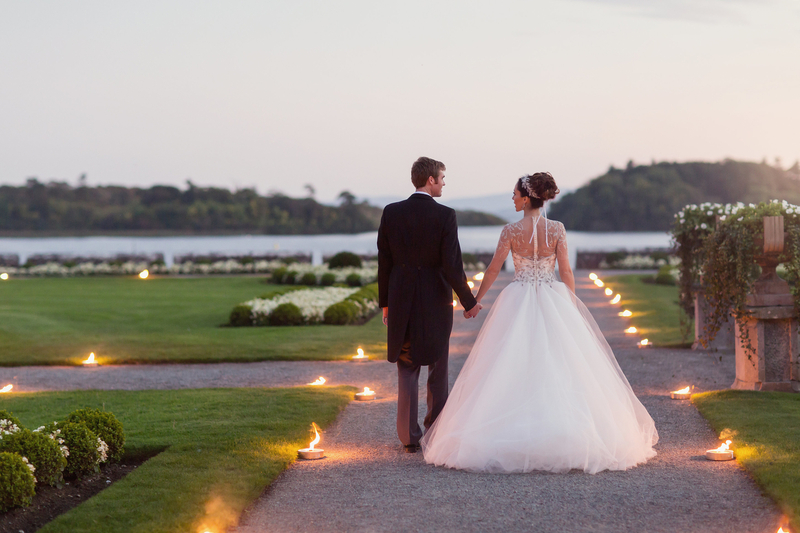 What advice can you give to other couples planning on having a destination wedding in Ireland? Juliana: You won't regret a single thing about planning your most special day in the most magical, friendly, hospitable country there ever was. Do be sure, however, to make sure that Olivia Buckley International are planning your wedding and I mean this from the bottom of my heart. Given the distance from the United States, given how many logistics, details, vendors, family member special needs, last minute changes, traveling issues are involved in coordinating a wedding from across the globe, it is imperative to have a company like OBI by your side every step of the way to ensure that your matrimonial event goes off without a hitch and that you have access to the highest quality of everything at all times. If you had the opportunity to renew your vows or do it all over again, how would you do it? Juliana: Without a doubt, we would hop on a plane right back to Ireland, to Ashford, and do it all over again, (obviously with Olivia and her team at the helm) and maybe with a few wee ones of our own to now accompany us down the aisle?! Many of our wedding guests have already asked us if we will be doing a renewal at the castle, and if they could please be invited to come back so it is certainly something we would absolutely love to do! "Olivia gave us the best gift we could have ever imagined for ourselves: a clear and worry-free mind, the breath and space to be fully present with each other on the most transformational day of our lives thus far".